I was lucky enough to do a lot of travelling when I was working as a consultant and I got to visit many different countries, and, of course, I’ve been on my fair share of overseas holidays too. With all that travelling around the world, I’ve picked up a few travel tips on how travel with the minimum of baggage. I must admit, I could never quite understand the attraction of lugging around one, or more, huge suitcases, at least one carry-on bag, and laptop as well. So, if you are going on a business trip or a short vacation, here are my ten travel tips for travelling light. I discovered this little trick by accident on a business trip Nigeria, when I arrived at the airport, but my luggage didn’t. I had a meeting first thing in the morning the next day so, that evening, I just took a short trip to the local pharmacy and bought all I needed there. It’s hardly rocket science! I might now carry a few things to freshen up when I travel, like a toothbrush and toothpaste, but I’d never carry shampoo, shower gel, sun lotion or anything else like that again. Buy it there and chuck it out before you leave. It will only cost you a few quid. Don’t weigh yourself down with any heavy items, like the travel iron that I used to carry around when I first started travelling. Unless you are really travelling off the beaten track, hotels will have irons, and other stuff like that, that you can borrow. When I was on business trips, I would always travel in comfy shoes and jeans, but I’d always wear my suit jacket and just pack the trousers. The same would apply if I took a smart jacket on holiday for any evenings out. For one thing, a suit has plenty of pockets for things like passports and boarding passes and, for another, unless you carry it separately in one of those, awkward to carry, suit holding thingy’s, a jacket will get badly creased when it is folded up in a suitcase. When you board the aircraft, just ask the flight attendant to hang your jacket up for you. Job done! When you travel frequently, you can get a bit blasé about packing and leave it all to the last minute. If you pack in haste, you will do things like pack six pairs of underpants and two pairs of socks for a four day trip! Ok, so you can always wash out a pair of socks in the sink in your hotel room, but it’s much easier if you make up a list of what you will need beforehand and pack your bag well in advance of your departure. 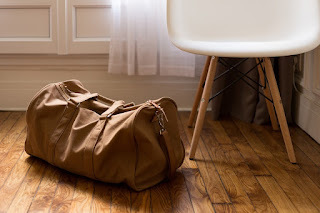 Don’t pack two or three of the same things, because there really is no point, especially for a short vacation or business trip. No one is going to notice if you wear the same pair of jeans for a week and the same casual shoes. 6. Buy a smaller suitcase! If you get this down to a fine art, you can avoid waiting at luggage carousels altogether, and last a whole week with what you can carry in a single, small carry-on bag. In any event, if you want to cut down on the weight you have to carry around, just buy a smaller suitcase. It will discipline you to pack less in the first place. A lot of people say that you roll clothes up so that you can get more in a suitcase. My travel tip is; don’t bother! The trick is to reduce what you are taking, not cram even more heavy items into a smaller space. Anyway, when you role newly washed items, they roll tighter than worn items, so you are only going to give yourself a problem when you come to pack again for the journey home. All you really need is one pair of smart shoes for meetings and evenings out, and a pair of casual shoes for everything else. If you are going on a beach holiday, buy a cheap pair of flip-flops or sneakers when you get to your resort, because they will probably only get ruined by the salt water and sand by the time you come home anyway. When I used to travel with my ex-wife, she insisted on packing clothes for eventualities like “in case it gets a bit chilly in the evenings”, “in case it rains”, and “in case we get delayed coming home” and that was for a trip to the Caribbean! You can’t possibly pack for every eventuality. So, if it gets chilly in the evening; go and find a bar indoors. If it rains; don’t go out for a walk. If you get delayed at the airport; complain to everyone profusely, and then go and spray yourself with deodorant. To really make the most of a trip to another country, you really need to experience the local foods, meet the local people, and embrace the local customs. I have heard of people packing things like tea bags, tomato sauce, and even crockery because they think the cups in the hotel bedrooms won’t have been washed properly! If you want a home-from-home; you might as well stay at home. So my travel tip is; only pack what you will really need. It’s a lot more fun than carting half of your worldly possessions around with you, and then bringing them all the way back home again. If you found this post useful, please do share it with your friends on social networks. Thanks!